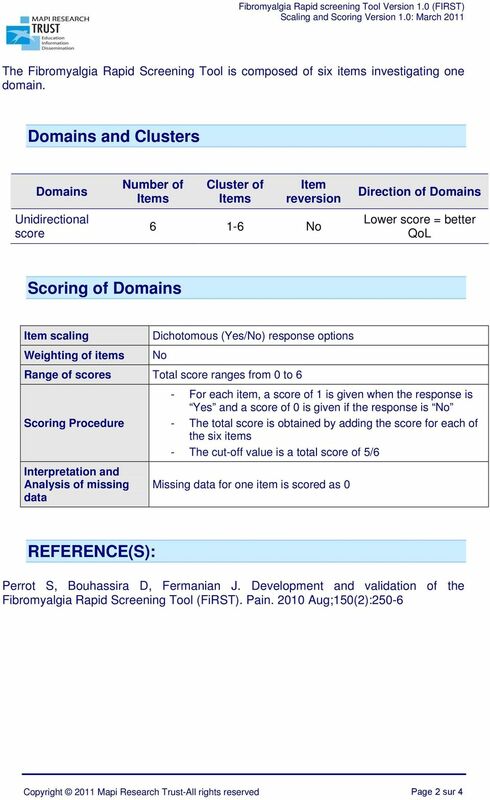 Download "FiRST Fibromyalgia Rapid Screening Tool Version 1.0"
5 The Fibromyalgia Rapid Screening Tool (FIRST) You have been suffering from joint, muscle or tendon pain for the past 3 months at least. 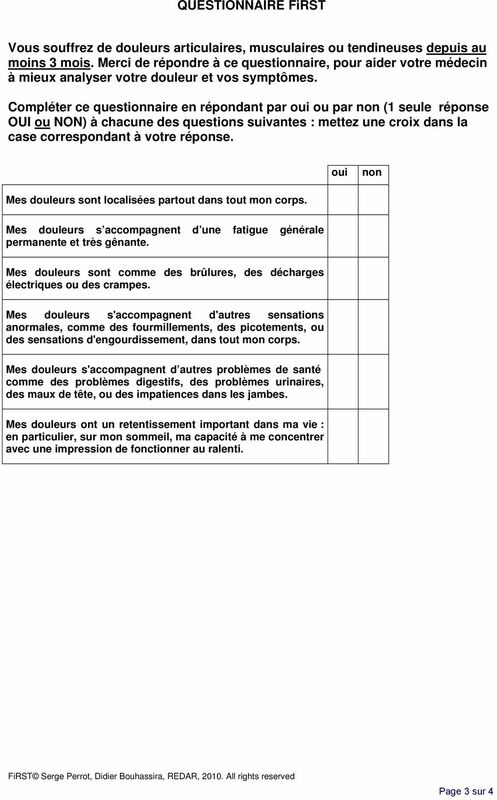 Please answer this questionnaire in order to help your doctor evaluate your pain and symptoms more effectively. Please fill in this questionnaire by answering either yes or no (only 1 answer: YES or NO) to each of the following statements. Put a tick in the box that corresponds to your answer. Yes No I have pain all over my body. My pain is accompanied by a continuous and very unpleasant general fatigue. My pain feels like burns, electric shocks or cramps. My pain is accompanied by other unusual sensations throughout my body such as pins and needles, tingling or numbness. My pain is accompanied by other health problems such as digestive problems, urinary problems, headaches or restless legs. My pain has a significant impact on my life, particularly on my sleep and my ability to concentrate, making me feel slower generally. 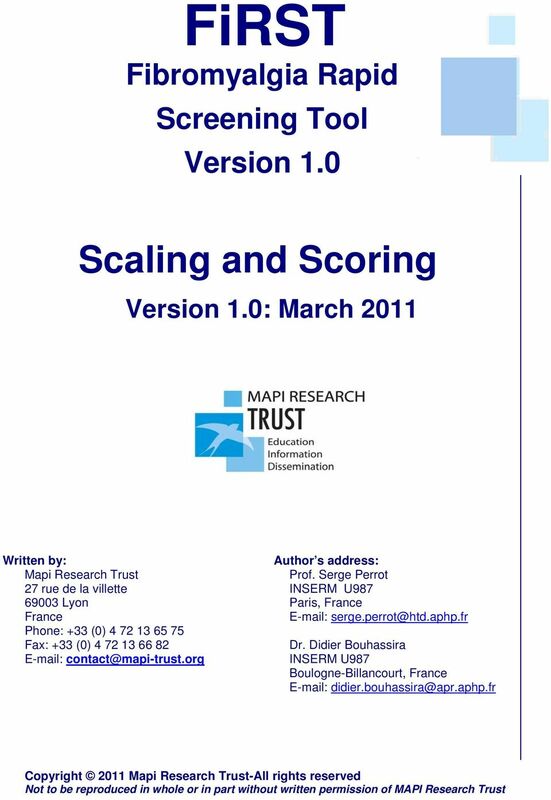 FIRST - United Kingdom/English - Version of 15 Sep 09 - Mapi Research Institute. ID5256 / FIRST_AU1.0_eng-GB.doc FiRST Serge Perrot, Didier Bouhassira, REDAR, 2010, All rights reserved. INSTRUCTIONS EN FRANÇAIS POUR LE SITE OMNIUM UNIVERSE www.omniumuniverse.com 1. CRÉEZ UN COMPTE SUR LE SITE OMNIUM : a. Dans la colonne de gauche, entrez votre adresse email ainsi qu un mot de passe. b.
Stool Test for Ova and Parasite (O&P) This test looks for parasites and their ova or eggs in the digestive tract by checking a sample of stool in a lab. A parasite lives on or inside another organism.